The tiny town of North Pole, Alaska is not actually located at the North Pole. However, that doesn't stop the town from capitalizing on the thousands of letters to Santa Claus it gets sent each year. The center of the region's holiday cheer is The Santa Clause House, which offers Christmas souvenirs and personalized letters from Santa  and is the site of the world's largest Santa Claus statue. Standing 42 feet high and weighing in at 900 pounds, this Santa is big enough to fit dozens of children on his lap (if he ever sat down, that is.) 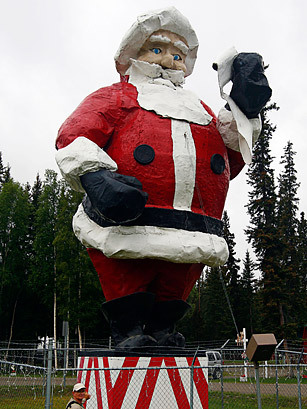 He was built for the 1962 World's Fair in Seattle and had a second career as a travelling promotional statue before ending up in North Pole, where he has stood since 1983. Any shopping list for his upkeep would certainly have to be checked twice: He takes 10 gallons of red paint, five gallons of white and three gallons of black.